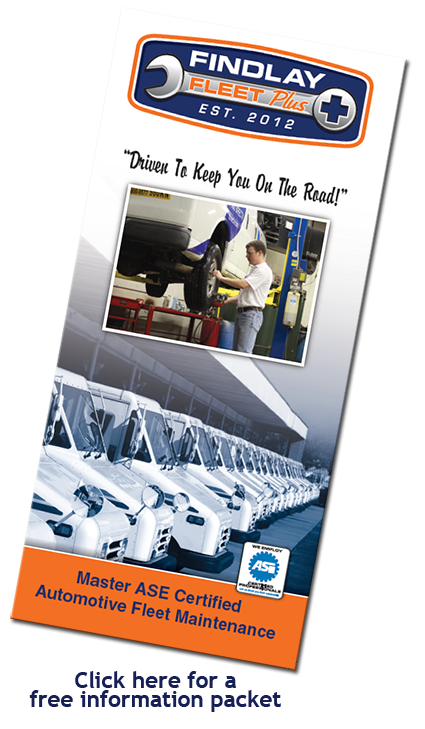 We have programs designed to keep you on the road! Findlay Auto Plus is a locally owned and operated company dedicated to comprehensive fleet management services for small and medium sized businesses. Based out of Findlay, Ohio since 2009, we have a Master ASE Certified Technician that works exclusively to keep your company vehicles on the road. Our talented technicians strive to exceed client expectations and have many years of experience in working with fleet vehicle management. Findlay Auto Plus specializes in helping companies with their vehicle fleet by maximizing productivity, increasing driver satisfaction and offering affordable preventative maintenance programs designed to help keep vehicles on the road and out of the repair shop. Our regularly scheduled preventative programs give your company a financial advantage by helping manage costs with predictable, low cost plans that virtually eliminate expensive and unforeseen mechanical repairs and non-productive downtime. We would like to thank you for your interest in Findlay Auto Plus. Give us a call to find out how we can team up with your business to start giving you great business benefit options.